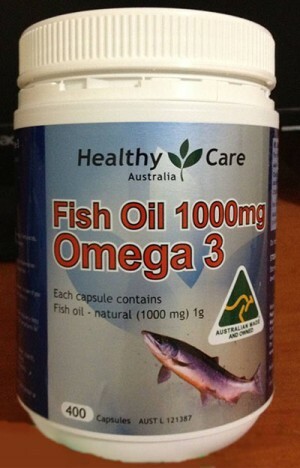 Detail Produk "Fish Oil 1000mg Omega 3 Healthy Care Australia / Minyak Ikan"
natural source of marine omega-3 fatty acids. Fish Oil contains the omega-3 fatty acids EPA and DHA, and can be taken as a dietary supplement. Fish oil provides an anti-inflammatory action within the body which may reduce inflammation and joint swelling associated with arthritis. Omega-3 fatty acids are also important for cardiovascular health. In addition to these benefits, Healthy Care Fish Oil 1000mg is a beneficial supplement to take if you cant manage the recommended 2-3 serves of fish a week. It is also high in DHA which is necessary for the normal function of the eye, brain and nervous system. – Fish oil (Natural) 1g (1000 mg) containing omega-3 marine. No added sugar, yeast, gluten, starch, wheat, corn, milk derivatives, preservatives, artificial colours, flavours and sweeteners.